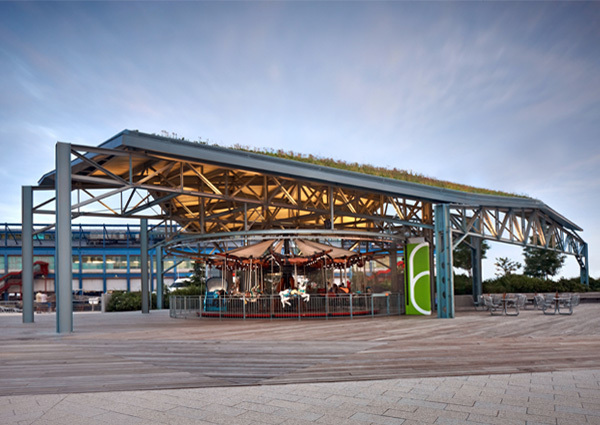 The carousel pavilion on Segment 5, Pier 62 is an architectural component of the landscape design proposal for what will be the largest breadth of park along the Hudson River in Manhattan. 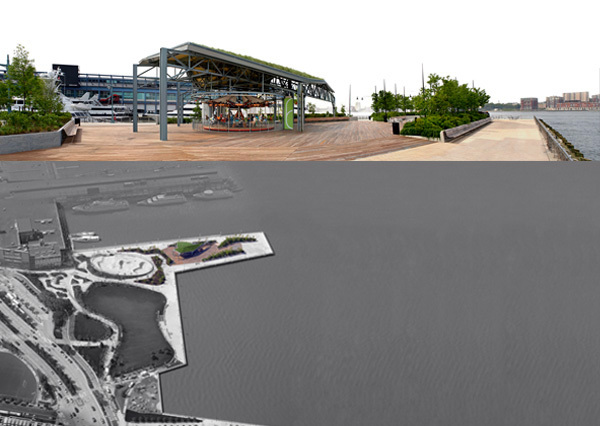 Pier 62 holds the southern edge of the segment of the park, which is directly north of Chelsea Piers, and exhibits a fragmented formal language contrasting the pastoral topography of the proposed Lawn Bowl with the curving pathways constructed on Piers 63 and 64. 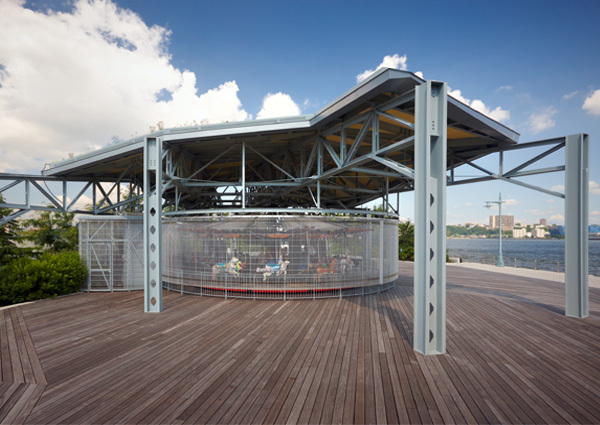 The shed housing the carousel covers an intensified activity area that asserts an identifiable presence and provides a gradation of program from the romantic park setting to the sports recreation spaces of Chelsea Piers. Following the language of fragmented forms proposed by the landscape architects for the south edge of the site, CDR Studio architects grafted a faceted thin shed roof over the carousel, unifying it with the shard-like planting forms that co-inhabit the pier. 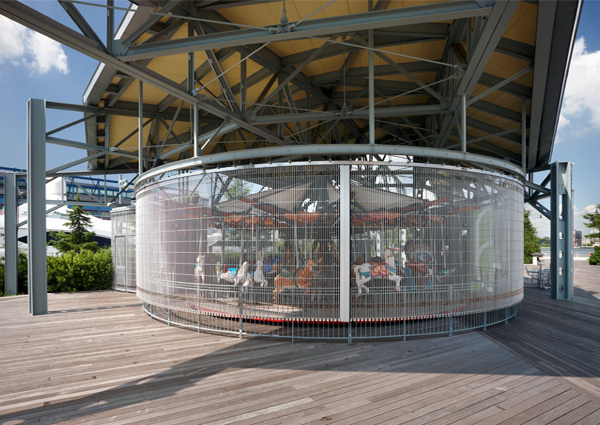 Opening to the north, the concrete shell roof provides cover for the carousel from direct sunlight, creating a darkened space, heightening the drama of the carousel color and lights. 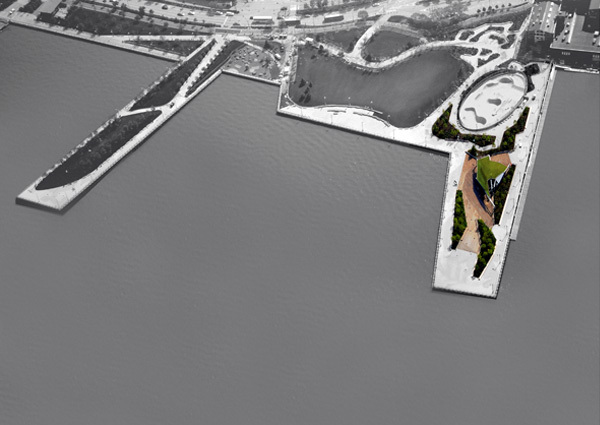 The roof orientation also effectively engages the pier, the lawn and the pathways to the north. The wood decking of the pier extends along the ground into the pavilion, up onto the wall and ceiling surface — thus enforcing a material continuity between pavilion and pier. 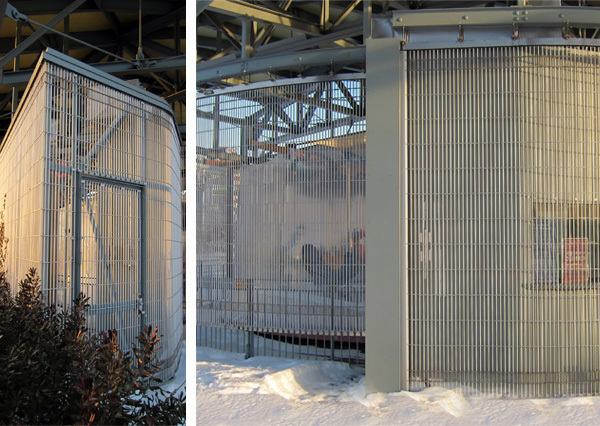 The exposed structure and industrial materials of the concrete roof and the porous grille roll-down enclosures recall the site’s warehouse past and provide a setting for the playful reuse of the water’s edge. 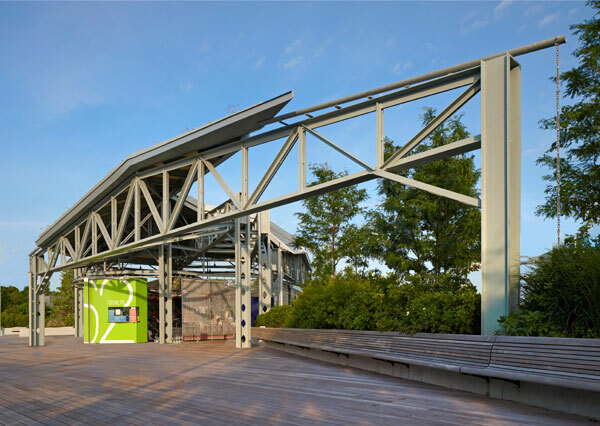 This innovative design involved the coordination of the park pier design with the pavilion and integrated a fully solar-powered roof with the potential to power the carousel and feed additional energy back into the NYC grid. 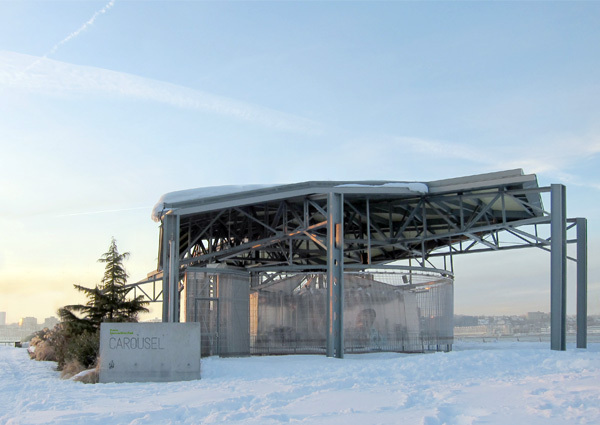 The pavilion acts as a shelter, a backdrop and a convergence of landscape and building.